A client who was using the SOLVED solution-focused cards called me and had some questions. He was not sure how to use the cards in coaching himself through a challenge. That presented an opportunity for us to use the SOLVED coaching process and see what happens. The image above is the six SOLVED questions he randomly pulled, plus we chose to use an image from the Points of You – Punctum discussion process. We both agreed that sharing this example may be helpful to others. There is a current client that I feel I am unable to help. What I’ve tried is not sticking and my time to make progress is getting limited. Question: What needs to happen in order for you to leave here saying that this was valuable to you? Identify a step for progress through the stuck. Alternative ideas to support the client. Identify some time to try a different approach. Question: It’s three days from now, and you have solved this problem. Who would be the first person to notice? What would they notice? What else? CEO -> In update meeting CEO would co-write the plan with me to complete: 1. change the structure of the management team. 2. put accountability pressure on management to define goals, and data to better know what outcomes are achieved through the organization’s work + the department’s work. 3. reference the project charter and remind the leadership team of what is in and out of scope for the work (the in/out scope is important because the team keeps developing ideas that cannot work.) 4. CEO and I would have energy when leaving the meeting, ending with a hug and agreement; 5. CEO would share with the leadership team, then share with all the organization the idea and plan. Question: Where are you on a scale of 2 – 10, with 10 being you know exactly what to do, and 2 being the opposite? How do you know this? Tried various things, some worked. In the last meeting, all senior leadership shared their concerns and confusion. Made small strides in getting CEO to notice incompetence in specific managers and the management team, plus the CEO took responsibility for placing these people into their positions and doing little to nothing about it. The team believes we can figure this out. The stronger team members who are excelling at their work are still onboard with the changes and the process. Question: Your solution is a string mixed with a bunch of other strings. All you can see is the beginning of all the strings. How do you recognize the string that is your solution? With enough of a pull, the knot comes undone. CEO will smile and stand up to take notes when the ideas are working plus being implemented. When we look at sensemaking, organization assessment, strategic plan, and competitor comparisons the next step is obvious. The team takes over, and I step back. Question: Choose one solution you have implemented and share what worked. What did the other person(s) do to assist this progress? In one department the director met with staff and used the NOIS plus Outcomes Worksheet. The team responded, and the director created 4 simple outcomes. The department is now measuring progress, plus recently gained a contract by sharing a value-proposition from the outcomes and comparison to competitors. Question: Given your current progress what does your next step look like? Write an understandable (less jargon) 3 options for the CEO to choose. CEO decides which option or combination of options is best. Work with CEO to explain his choice with the team. The team decides which direction is best for them – Not me! Those are not my hands, and this will not get done by my hands. The hands are the CEO + team. My job is to be like yeast or air to support action. As they move the work I support an environment so good/bad is obvious and change happens. 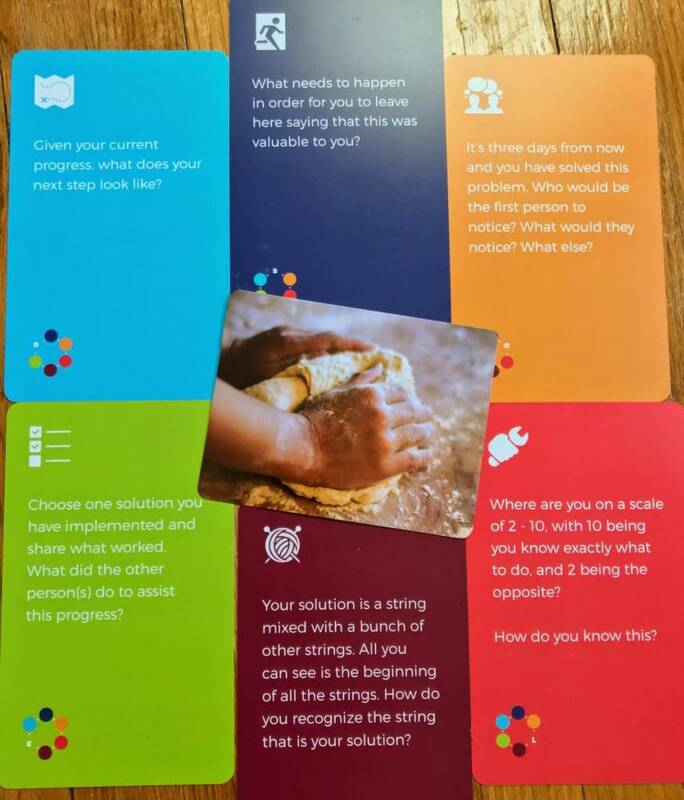 The client felt better, and I have an example of SOLVED coaching cards used in a self-coaching process. 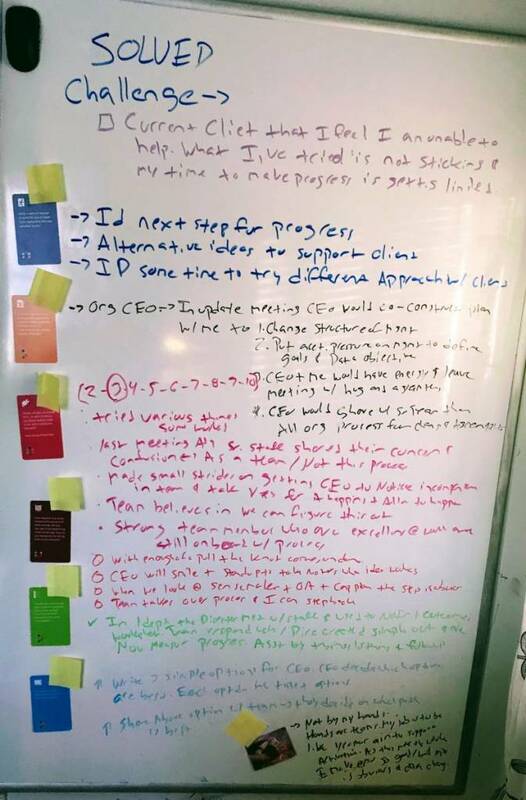 Below is the whiteboard with the responses written.